Nintex Workflow for Office 365 recently released the Salesforce Connector on Nintex Store which allows you to integrate your workflows with Salesforce easily. 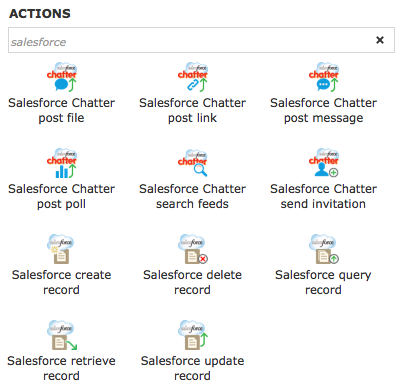 In this post, we will discuss on how to configure each of the Salesforce Chatter actions. Tip: It is recommend to configure it with an account that doesn’t have password expiry so that you don’t have to revisit this section when the password has changed. Hadoop, the open source big-data framework, has gradually evolved from being a shiny object in the laboratory to an increasingly serious tool finding its place in the Enterprise. At Gigaom, we’ve covered Hadoop’s increasing maturity, and completeness as an enterprise technology, because that’s been the story. But now the story is changing. The change emanates from the release of Hadoop 2.0 and the rapid standardization on that release’s new resource management engine, YARN. YARN moves Hadoop out of the world of batch processing, to the interactive world. We’ve covered that too. But while the change in the story builds on that facet of YARN, it pivots rather dramatically. Who’s Already Benefiting from The Cloud? In order to evolve as a country we learn how to make the way we do business more and more efficient everyday. Cloud computing is becoming increasingly important in most areas of business due to the advantage of having important information in a safe place that is also easily accessible to others in your company. This assignment instructed us to choose a CMS of our choice and install it from scratch on our own server. I bounced between WordPress and Drupal but ultimately decided to go with WordPress as it is the CMS that the majority of the classwork is based upon. I currently use Amazon Web Services (AWS) as my hosting service, so there is no “1-click” installation option like many of the other hosting services provide for WordPress. Amazon has some pretty extensive help documentation however, and I was able to find a listing that spelled out the steps involved. It can be found here. Below is a summary listing of the steps it took to get WordPress installed and running on AWS. Everything was done via command line interface using the PuTTy client. Multi-Factor Authentication as utilised by AWS uses a TOTP (Time based One Time Password) setup with either a hardware or ‘virtual’ MFA device. The virtual device being the most commonly used, allowing you to use applications like Google Auth on your smartphone to generate passwords that are only viable for 60 seconds. This means that if you have MFA enabled, even if someone has your password, so long as they don’t also have access to your (hardware or virtual) MFA device, they’re unable to login to your account. MFA as utilised by AWS is pretty straightforward to setup, scan a QR code, type in a couple of PINs, job done. So long as you have the right permissions.